Finally getting a chance to write and upload my first painting from the current Colony session. 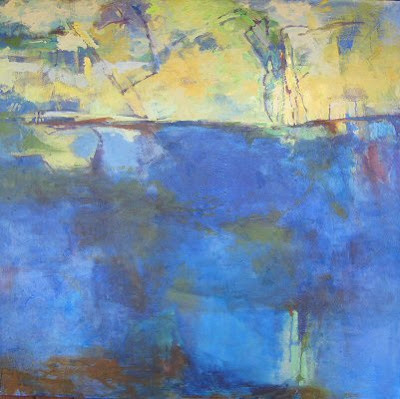 This one is 40 x 40″ acrylic on canvas. What other title could I give it but “Watery”?? I’m now waiting for paint to dry…you’ve heard that old saying I’m sure. Thank goodness for acrylic. Still you do have to wait a short time for the ground and tone to dry and it’s almost lunch time so I decided to take this photo and write a little. We’re having a fine time as usual…the weather is cooperating, although a bit warm and muggy for the April sessions. That’s better than cold and tornados for sure. Maybe I shouldn’t write that as the session isn’t over yet. I’ve got a strange one going that I will show later…or NOT. It’s that time again…….twice a year I load up lots of art supplies and head to Mississippi Art colony. It’s so wonderful to be able to get away from everything…no cooking, cleaning, and interruptions. Just paint and see other artist friends. Things have been so hectic here lately, sometimes I wonder if I can remember how to paint. You know how it is when you get that anxious feeling to paint when life is not supporting your studio time .Then you get there one day, and the muse seems to have gone missing. Well…….I may not make any masterpieces at colony but that is the only thing I have to do all day Wednesday-Saturday with Tuesday and Sunday spent loading, unloading and traveling. Even the traveling is not wasted time as I enjoy just listening to the radio and thinking on a drive by myself. So, lots of stuff in the foyer and dining room waiting for more stuff to follow and then the loading will begin. 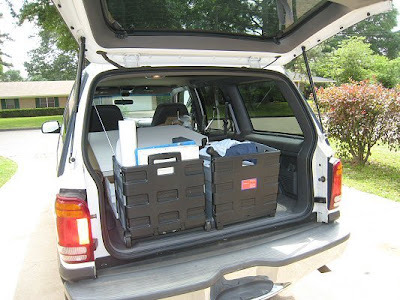 My easel is already in the SUV. I usually take waay more than I need but who cares. If the muse comes to visit, I’ll need it all or at least the most important part, canvas, paint, and my own mind and imagination. Went out and took this picture of a partial load of the above mentioned supplie…still got to find a place for my pillows and clothes somewhere….kinda wondering if I can fit in that diptych that’s not finished or just leave it here for later. Good paintings or not, it will be a rewarding trip; it always is. I’ve been over to the farm for a couple of days. We’re continuing to work around the place. This morning we had a few “surprise visitors”. If you could have seen the whole thing it would have been hilarious. There were 19 kinda tame cows that had gotten out of the pastures on down and across the road from us…so they must have just come up the first place they could and came into the front drive, looked around and found fencing everywhere so they just ran around the side and back of the yard until they couldn’t go any farther. We hadn’t heard a thing but were in the back living room assessing paint on the walls with the window blinds up and there they were. Suddenly Curry yelled, “those cows are in the YARD, not the pasture” and he headed out running. Anyway, he blocked them in the side yard and yelled at me to move my Explorer in beside the Blazer so they couldn’t get out. I am not experienced in cow herding at all so Curry told me to be quiet and don’t make any sudden moves. 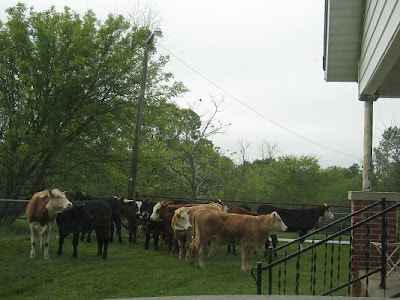 Now that can give you pause when a bunch of cows are looking your way as your husband is in the house calling the guy who leases the pastures. He found the people (as they didn’t belong to the guy who leases our place)and they came right out and we got them in the back pens until they could be loaded on a trailer this afternoon. They are kinda tame according to their owner thank goodness and didn’t spook. 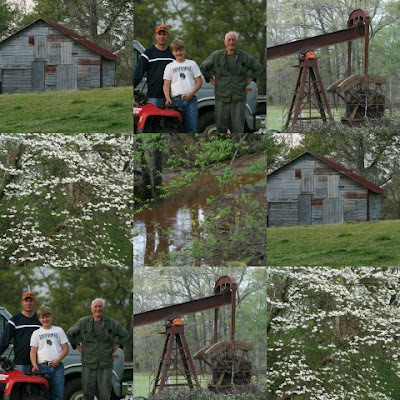 I took a couple of pictures…Here’s one along with a collage of pictures my daughter in law took last week and sent me. 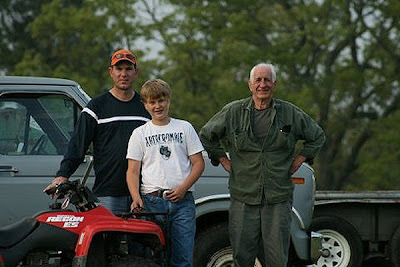 ..and another of my son, grandson, and Curry taken at the same time. Looks like life is going to be interesting.